AF Area Selection Modes are ideal for the users who are not very experienced and we need it in conditions where it is impossible to use the manual focus. Relying on fully automatic autofocus mode is handy and in the early days of learning, it is probably necessary. If we want to really learn photograph and multiply the creative tools at our disposal we have to know where to put your hands when the results do not satisfy us. AF Area Selection Modes is such an area to know about. We talked about the autofocus in another article. On that occasion, we mentioned the fact that the DSLR cameras and bridge cameras provide multipoint autofocus systems. They provide different points in the frame on which you can focus at. The choice of the point of focus is very important in the composition of the photo. For example in portraiture, when we want to precisely focus the eyes or generally when we apply the rule of thirds and we want to focus on the point of interest. The choice can be totally in the hands of the photographer or delegated all to the camera. This is the basic reason to know about the AF Area Selection Modes. Unfortunately, there are some significant differences on this issue between the various camera manufacturers. We will try to generalize, so that the concepts explained here can be applied regardless of the camera model. Then we go to see three AF area selection modes: single, dynamic and automatic. In this mode, the photographer, uses the switch on the back of the camera, choosing among the available points want to focus on. Once focused, if the subject or the camera is moving, he/she will need to refocus. Provides maximum control by the photographer. When to use: This mode is fine when the subject is static (such as a person posing, a landscape, an object). It may also be necessary when we realize that all the automatic modes fail. Generally, however, is not indicated when we frame moving subjects, especially if the movement is rapid. Even this mode too, allows the photographer to select the point he/she want to focus from those available. However, differently from the previous one, in this case the subject in focus can move, it will use the information detected by the surrounding points to recalculate the focus. 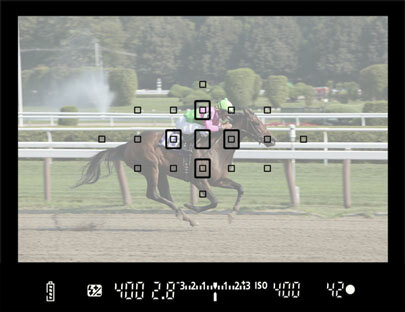 This allows you to “chase” with the autofocus of moving subjects. When to use it: as you may have guessed, this AF area selection mode is useful when framing moving subjects: animals, vehicles, people running. Of course, the camera will not be able to focus only the subject alone. However, it will help us as long as we can, keep the subject in the area surrounding the selected focus point. The composition of the shot, however, becomes too unpredictable. This is often the default mode in the automatic shooting modes. It defers completely depending on the camera and the choice of the point of focus. When we choose this mode, therefore, we have no way of knowing with certainty what point in the frame will be in. This is to be avoided if we want to control the blur. This is good in travel photography or in emergency situations. This Article Has Been Shared 5744 Times! Cite this article as: Abhishek Ghosh, "AF Area Selection Modes : Total Control of Focus," in The Customize Windows, April 13, 2013, April 21, 2019, https://thecustomizewindows.com/2013/04/af-area-selection-modes-total-control-of-focus/.